Our Minneapolis location has a paintball gear store that provides everything needed for the game from the helmet to the paintball markers, as well services for the compressed air paintball tank. The Splatball Paintball store is the ultimate paintball gear store that also offers repair and maintenance for every paintball need. The staff is professional with several years of experience with factory certified technicians. The gear comes from some of the top paintball equipment manufacturers which includes: Tippmann, Planet Eclipse, Proto, Dye, Ninja, JT, US Army Paintball, Valken and a host of others. Games can be played in numerous places including indoor or outdoor fields or simply on hard floors. Action Packed Paintball Games has become one of the favorite outdoor paintball parks for Minneapolis and the surrounding Minnesota areas. Their facility has several playing fields and is packed with activities for participants and spectators alike. This premiere park offers both reservations and walk-on games for single or small groups. There is paved parking, indoor restrooms and friendly, capable staff to service all your needs. The Action Packed Paintball Games is a perfect choice for birthday parties, family reunions and a variety of other social gatherings from the youngest to the oldest. With a dining area equipped with grills and vending machines, everything needed is conveniently located all in one location. 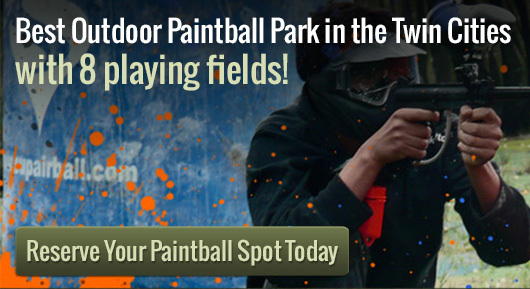 Whether you are looking for the ideal location for a celebration with paintball games or a paintball gear store for purchasing or maintenance, the Action Packed Paintball Games Park in the Minneapolis, MN area is the perfect choice.